In January, we spent a few minutes with Nancy Hoffman, the newest addition to the accounting team. As PSA’s Credit Manager, my focus is to maximize sales while protecting the company’s assets. I am our customers’ primary contact regarding their accounting needs from and obligations to PSA. This includes collections, maintaining account records, generating statements, and working with deductions and disputes. In order to improve cash flow into PSA, I work with our vendors to track our customers’ credits. It will be three months on February 1st. As one of PSA’s newest employees, what do you enjoy most about working here? I love the team spirit! I appreciate everyone’s helpfulness during the learning curve. I also think NetSuite is a great ERP software package to work with. I like to travel – I have 13 states to visit before I can say I have visited all 50. I really enjoy food (both cooking and tasting), baking and entertaining in my home. I’m passionate about California wine….red wine…wine from Washington/Oregon too….white wine…Schramsberg sparkling wine…..wine, wine, wine! I also like to do several craft projects like quilting, knitting and scrapbooking. I was married for 29 years and have been divorced for 14. I do not have children but my BFF has always shared her children. I brag I have two Rent-a-Kids and four Rent-a-Grandkids that are just like my own. 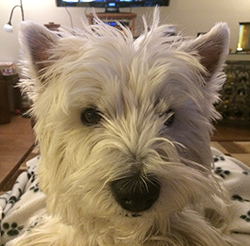 I share my home with my five year old West Highland Terrier, Winston, who runs the show!